INCORPORATING PASSIVE HVAC INTO SMALL SCALE RESIDENTIAL PROJECTS. As a member of the built environment profession I believe there is a an ethical obligation to future generations and specifically my clients to investigate alternative methods for heating and cooling projects, something, which by and large is currently both economically and environmentally taxing. Reasons that simple vernacular principals are largely being ignored in contemporary architecture? 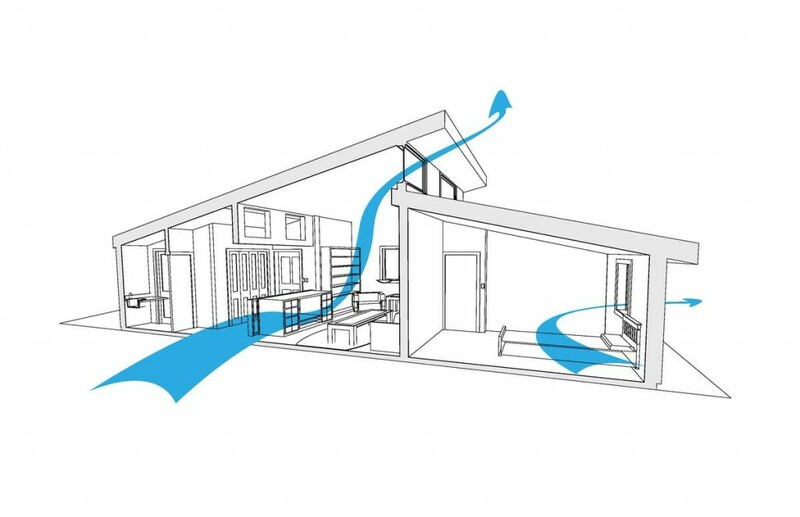 Many architects and building designers in recent history have decided to disregard simple vernacular lessons and passive methods of heating and cooling a dwelling instead favouring inefficient mechanical Heating Ventilation and Cooling (HVAC) known collectively as ‘active systems’. It has been recognised that these systems are both inefficient and can have negative effects on health; Legionnaires Disease, Sick Building Syndrome, etc. (EPA, 2012). The opinion of future building occupant is often taken out of the equation, instead it is believed that developers rely on stereotypes and assumptions. Consumers are occasionally consulted in the process but rather than given free reign are limited to ‘choices’ between similar existing norms rather than offered alternative passive system (Birkeland, 2008, 102). The problem of non implementation of passive systems can also be traced back to developers who assume to know what the customer wants or even in some cases to institutions such as universities who have instilled the message to their students that passive systems can be ‘ugly’ (Birkeland, 2008, 102). What are the key success criteria? Birkeland, J. 2008. Positive Development: From vicious circles to virtuous cycles through built environment design. London: Earth Scan. Environmental Protection Agency (EPA). 2012. Indoor Air Facts No. 4 (revised) Sick Building Syndrome. http://www.epa.gov/iaq/pubs/sbs.html (accessed March 02, 2012). Rudofsky, B.1964. Architecture without Architects. New York : MoMA.